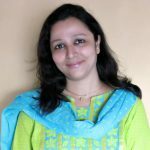 Hello everyone, This s Hussena from Quill and Punch Works, and I am extremely honoured and delighted to be a guest blogger on the Spellbinders blog. 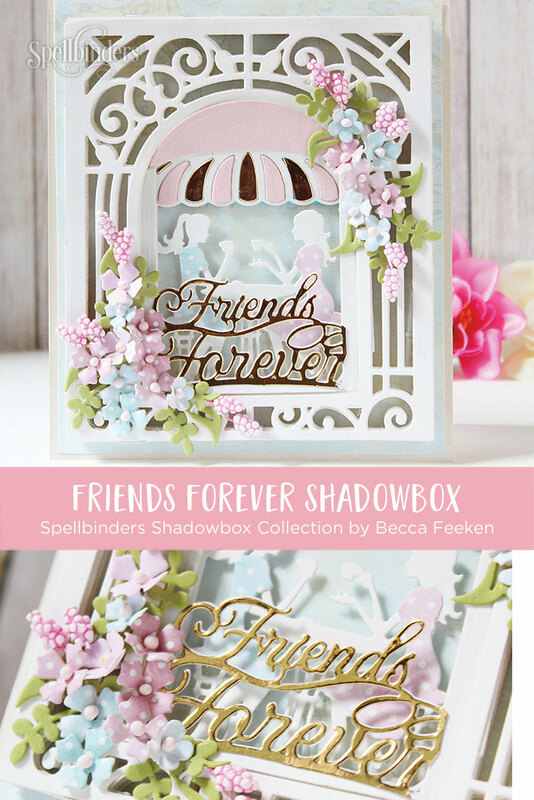 Today, I have THREE projects to share with you using the Shadow Box Collection by Becca Feeken. I am sure most of you must have seen this stunning collection during Creativation 2019, but those of you who haven’t seen it yet, do click HERE to see the full collection. 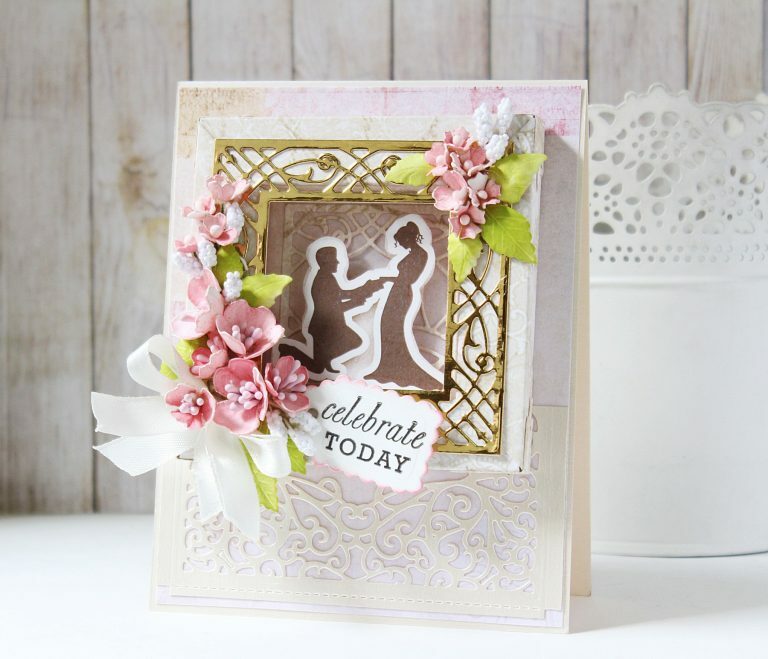 The Shadow Box Collection by Becca Feeken is a series of etched dies that help create beautiful shadow boxes and beyond. 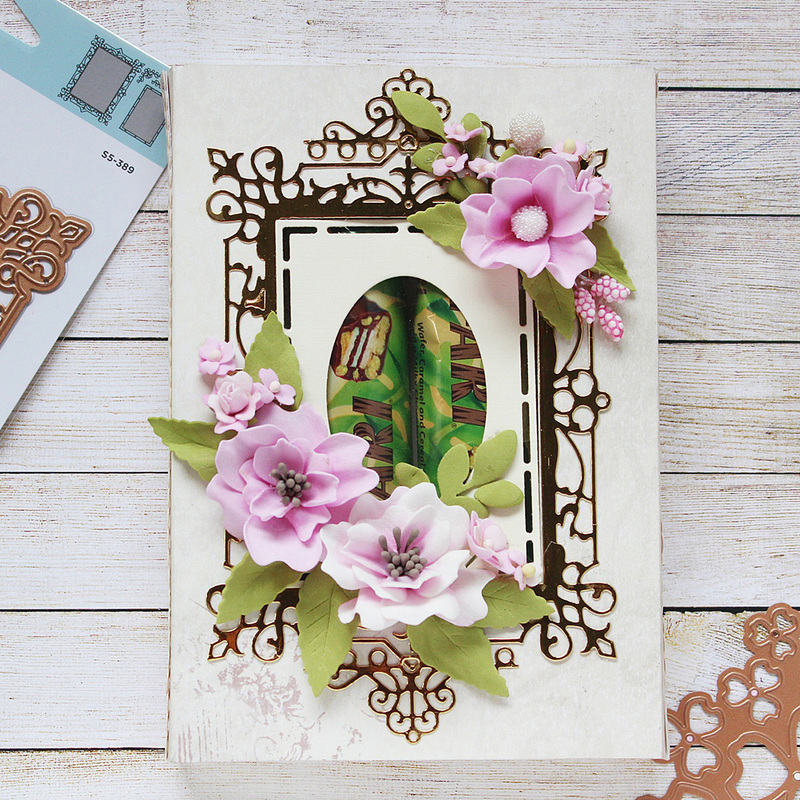 It has it all, from adjustable shadow boxes to layered scenery to accent embellishment, that will help make wonderful creations. These sets can be used alone, within the collection and some match with her 3D Card etched die sets in the 3D Vignette Collection. I have a trio of projects to share today, so let’s get started! My first project is a dimensional card I created using the Adjustable Shadow Box Frame with 3/4″ Border Etched Dies. 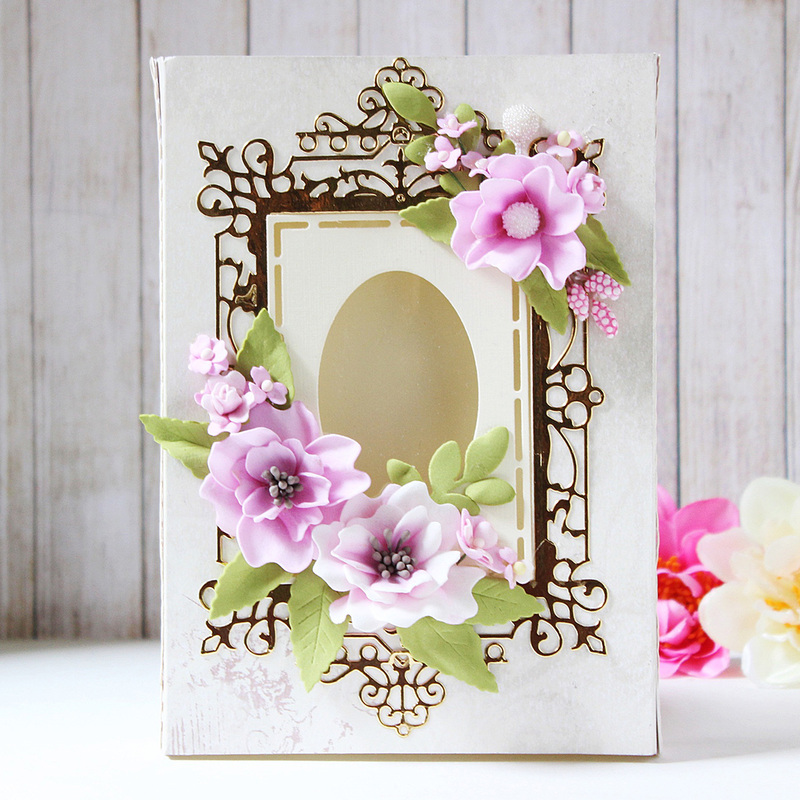 To create this card, I first die-cut the 3/4″ Border Dies from some patterned paper to create a square shadow box on the front of my card. Did I mention how easy peasy it is to construct a shadow box using these dies? These are a total game changer and I love how they have been designed with so much thought and precision. 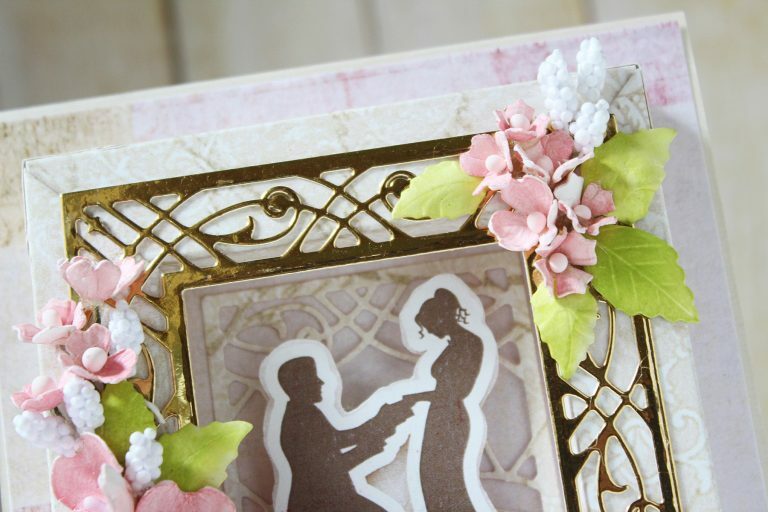 Once my shadow box was ready, I adhered an ornate square frame die cut from the Adoria Square Shadow Box Frame Etched Dies. I die cut it from gold foil cardstock to add a regal touch! Once the base of the card was ready, it was time to embellish my card. I first die cut a border from the Filigree Shadow Box Easel and Pocket Etched Dies from metallic white cardstock and adhered it on the bottom half of my card. 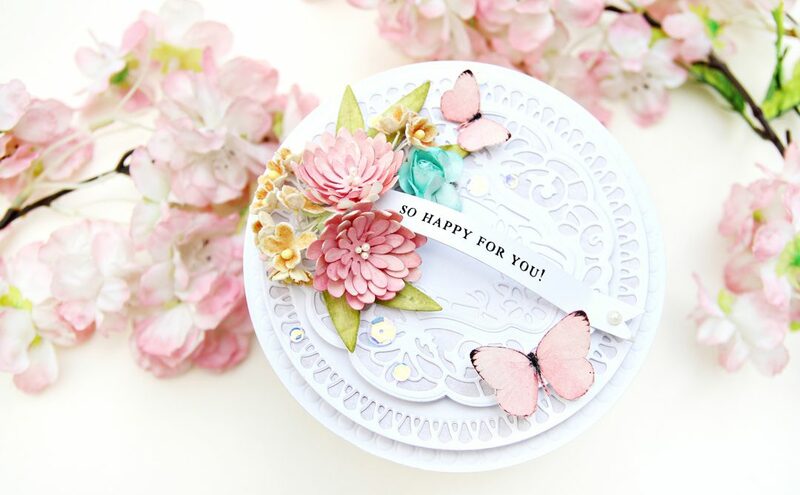 Next, I created a cluster of handmade blooms by die cutting the flowers from the Cinch and Go IV Etched Dies from white cardstock and then colouring them using dye inks in shades of pink. The leaves were also die cut from white cardstock and coloured using green dye inks. I added a little sentiment tag to go along with the flower bunch. I also added a small flower cluster on the other side of the frame to balance the design. I find these tiny flowers really pretty! And here’s how the card came together. This would be perfect to give to a couple for their engagement or wedding! My next project is a Gift Box with a twist. 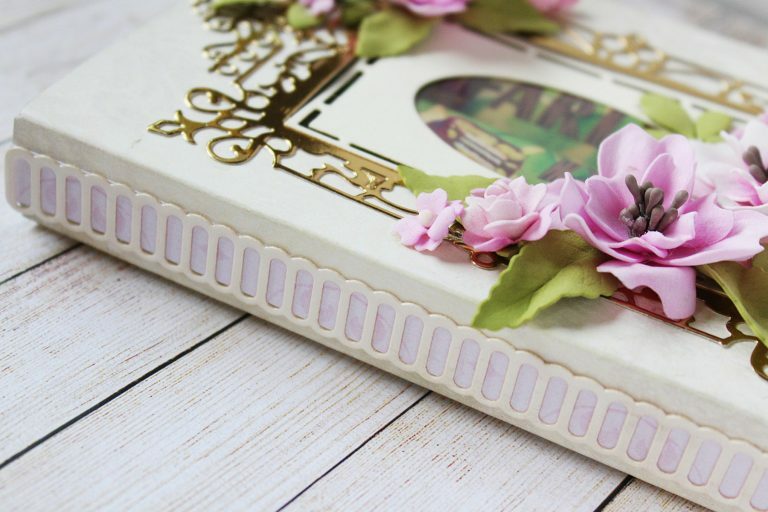 I have used the Shapeabilities Adjustable Shadowbox Frame with 1″ Border Etched Dies to create a Slider Gift Box which can hold some chocolates, jewelry, candles, or more! I made this slider box by first creating a 5″ X 7″ frame (cut two 5-inch straight edge border frame and cut two 7-inch mitered edge border frame. Fold the frames into a tube and adhere, place adhesive on tabs and create the frame, then adhere a paper on the back-side of the frame to create a box). To create the slider portion of the box, I took two sheets of 6 1/2″ X 7 1/2″ paper, and scored it at 3/4″ inch on either side, and glued both the papers on the two sides. 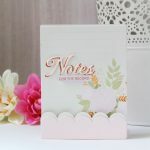 The flowers are die cut from the Cinch and Go IV Etched Dies from white and pink Foamiran sheets and coloured in the middle using two shades of pink dye inks. 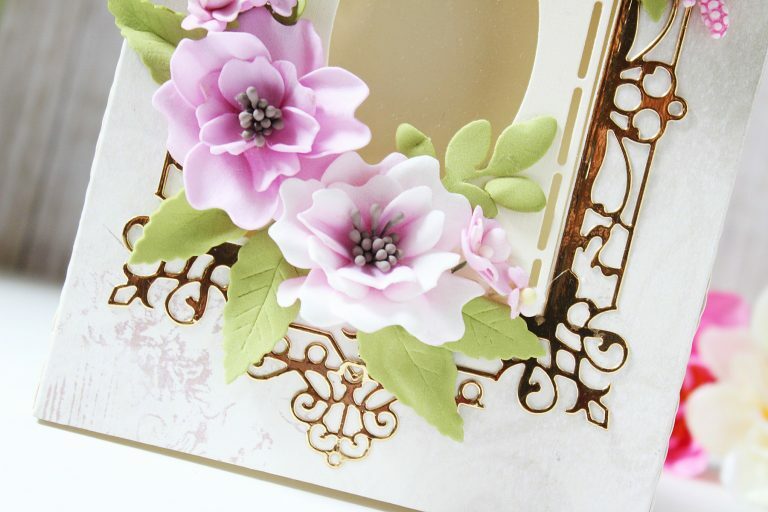 I LOVE using them with Spellbinders dies to create my own floral embellishments. The leaves were die cut from light green Foamiran and slightly embossed to give them some dimension. Here is how the shadow box frame and the cover looks like when opened. I added two chocolate bars inside to show the depth of the box. 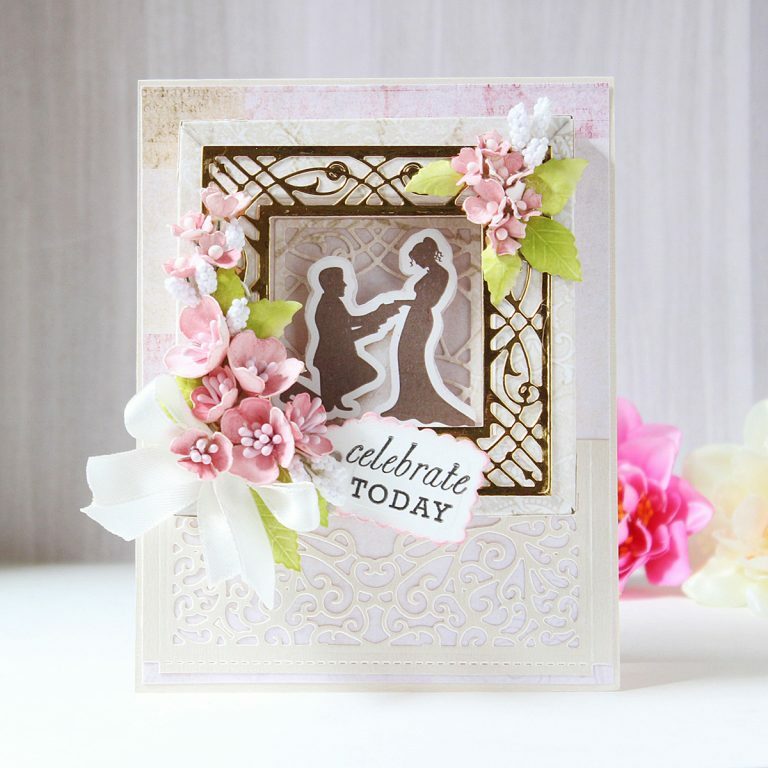 The gorgeous, intricate frame that you see on the top is die cut from the Callista Rectangle Shadow Box Frame Etched Dies. 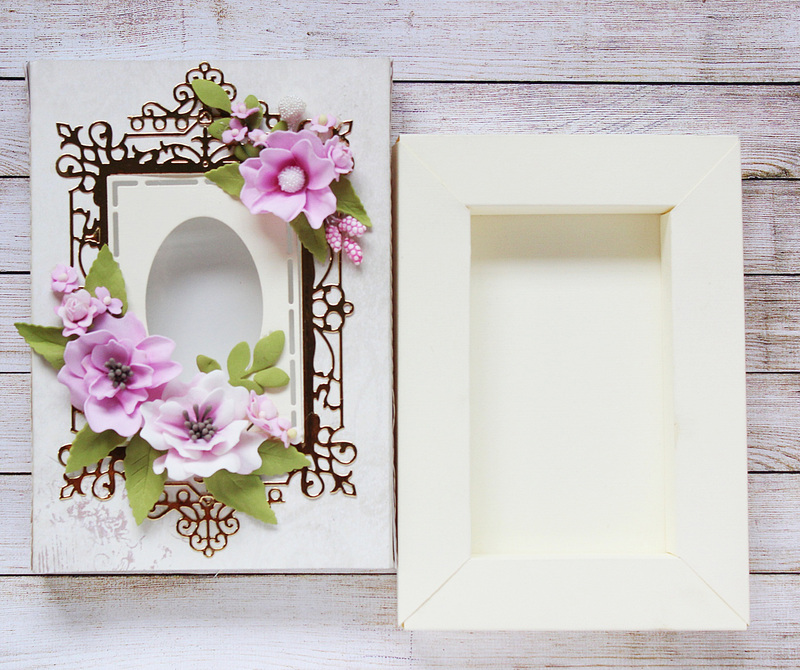 I also added few accent pieces to the rectangle die cut frame to further enhance it’s look. The oval aperture was cut using the oval die included in the Lisette Oval Shadow Box Frame Etched Dies, and fit perfectly with the large frame. I also die cut some borders from the Shadow Box Ribbon Threader Etched Dies and adhered them to the sides to hide the seams which were created while adhering the two strips of paper. I die cut the ladder dies from patterned paper and cream cardstock so that it would work perfectly with the color scheme of my project. 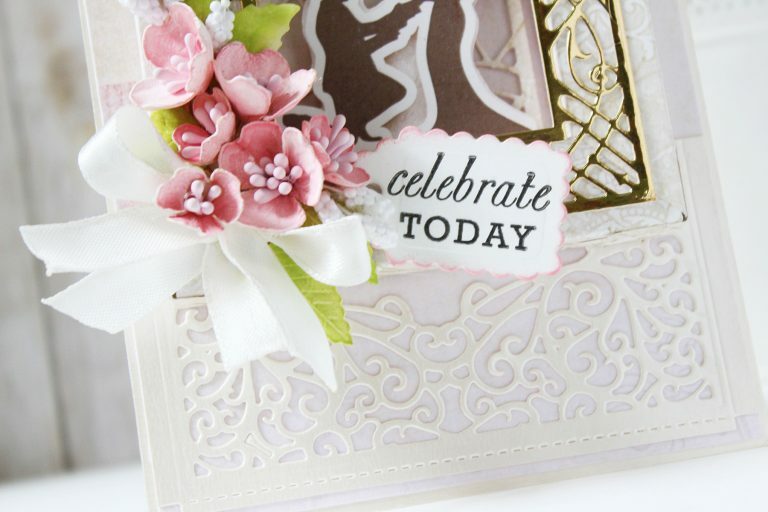 My last project for today is a card in which I have combined dies from the Shadow Box and 3D Vignette Collections. This card took me some time to make, as it is very detailed and dimensional in nature. I have die cut four of the Grand Arch 3D Card Etched Dies and stacked them on top of the other using double sided foam tape. Next, I die cut the Layered Friends Forever Café Scene Etched Die from white cardstock, and adhered the die cut canopy and the itty bitty pieces over it. I die cut them from light pink and gold foil cardstocks so that there would be some visual interest on my card. 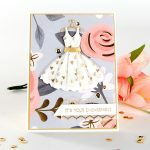 Then, I die cut the dresses of the girls from patterned papers so that I could add it to their silhouette die cut images. 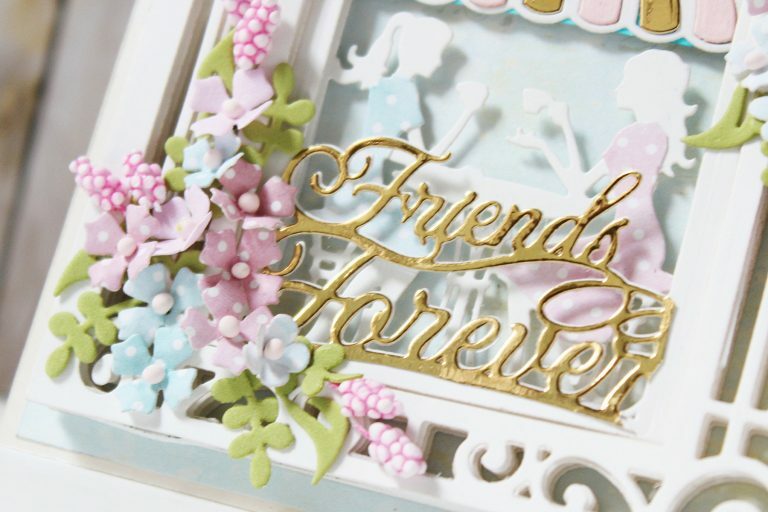 All the dies used for creating this scene on the card are from the Layered Friends Forever Café Scene Etched Dies set. 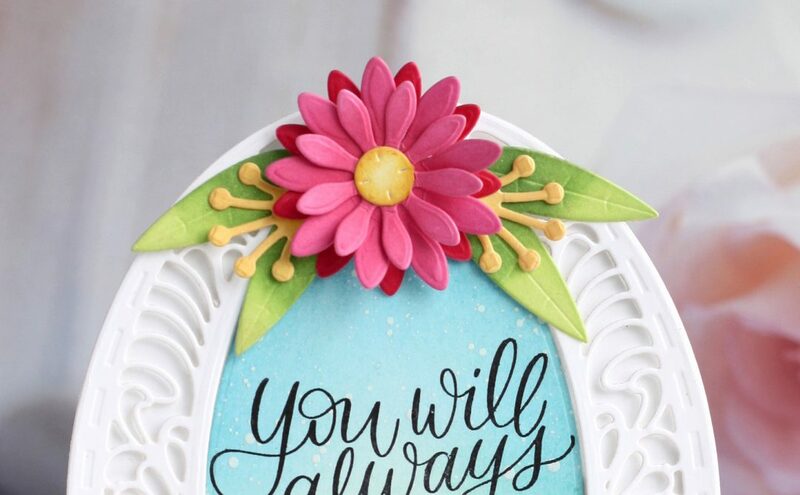 The sentiment is also a part of the same set and has been die cut from gold foil cardstock. 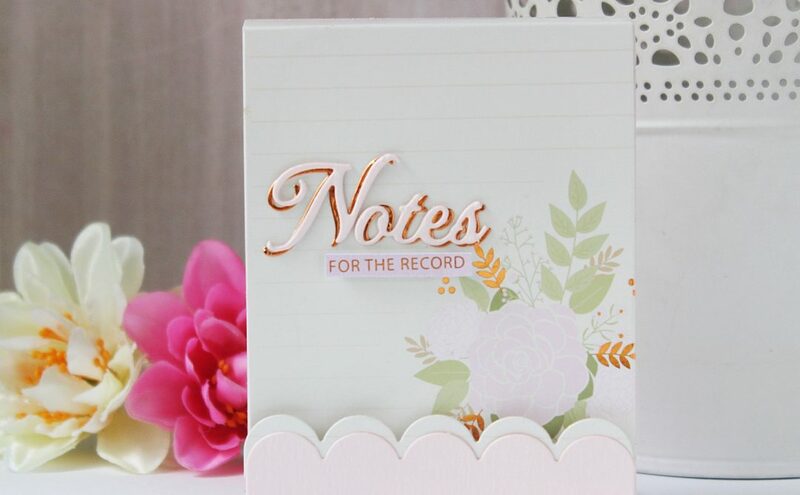 To complete the card, I added loads of little flowers on either sides of the card. 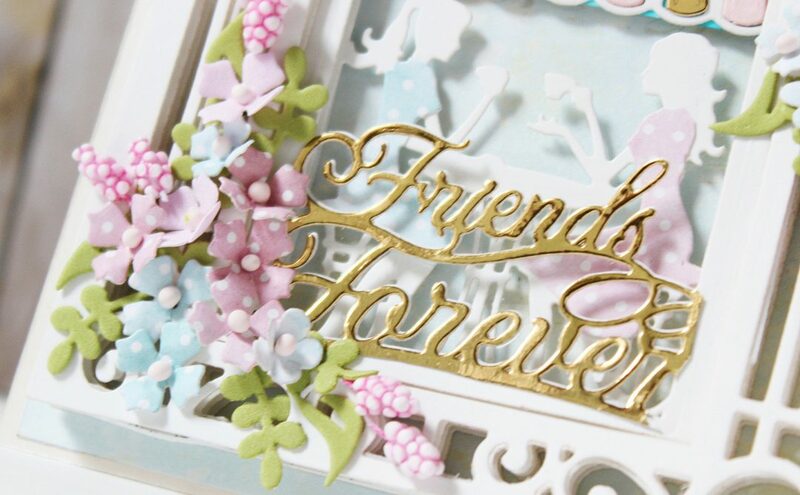 These flowers were die cut using the flower dies included in the Layered Sweet Birdie Thanks Scene Etched Dies and Layered Friends Forever Café Scene Etched Dies set. I die cut them from the same patterned paper sheets I used for die cutting the dresses of the girls. The leaves were cut from green Foamiran and tucked in here and there to complete the floral cluster. Here is a look at the final card. This is absolutely perfect to gift to your best friend or your girlfriends! Neenah Solar White 110 LB cardstock, Cream Linen Textured 12 x 12 Cardstock, American Crafts Colored 12×12 cardstock, Papericious 12 X 12 The Wedding Collection, White 80 LBS Cardstock Sheets, Gold Foil Cardstock, White Fun Foam; Adhesive: Scrapbook Adhesives 3D Foam Squares, Tombow Mono Multi Liquid Glue, Double Sided Foam Tape, Glue Gun; Stamps: Papertrey Ink Mega Mixed Messages Greetings; Inks: Altenew Cherry Blossom Mini Cube Set, Altenew Green Meadows Mini Cube Set, Versafine Onyx Black Ink Pad; Foamiran Sheets (White, Green, and Peach), McGill Inc. Paper Blossoms Tool kit, Pollens, Micro Rose Buds, Ribbon. I hope you liked my projects and found them inspirational. I loved working with this collection and do have a couple of more projects to share in the coming days. 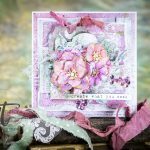 I would also like to thank the Spellbinders team for having me here on the blog and letting me share my work with you all. If you liked my projects, I would love to hear what you think of them. Thank you so much for stopping by! Gorgeous project Hussena !! So romantic with soft colors . So fresh colours! I love your project!